U3O8 Corp. Discovers New Style of Uranium-Vanadium at La Rosada, Laguna Salada District, Argentina. Toronto, Ontario – January 11, 2017 – U3O8 Corp. (TSX: UWE, OTCQB: UWEFF) (“U3O8 Corp.” or the “Company”) announces assays from a second type of uranium – vanadium mineralization that occurs in addition to the typical mineralized gravel at La Rosada, an area that lies within the larger Laguna Salada Project in Patagonia, Argentina. Figure 1. Map showing the location of the La Rosada exploration area relative to the footprint of the Laguna Salada resource and the gravel plain in which the mineralization occurs (inset map). The main map shows the location of mineralized tuff (pale blue) and gravel (green). Table 1. Summary assay results for composite panel samples from the walls of trenches excavated in rhyolitic tuff (volcanic rock) from the La Rosada area. Results from tuff from a prior press release made on November 12, 2013, before the significance of this mineralization was appreciated, are included (shaded grey) for completeness. Uranium-vanadium is exposed in rhyolitic tuff where the overlying gravel has been eroded at La Rosada. The three zones of mineralization identified to date have a high proportion of carbonate where the tuff has been altered and weathered to form a soft, friable layer that starts anywhere from surface to a depth of 1.5 metres. The average thickness of mineralization in the La Pala zone is 0.9 metres with an average grade of 3,128ppm (0.31%) U3O8, with grades ranging between 0.23% and 0.39% U3O8 (Table 1). Mineralization in the 12 Zone averages one metre thick with an average grade of 2,522ppm (0.25%) with a grade range of 0.04% to 0.9% U3O8. The layer of mineralization at Pescado Norte is thinner, averaging 0.5 metres with an average grade of 2,679ppm (0.27%) and a grade range of 0.09% to 0.79% U3O8. Vanadium grades are relatively constant at 0.1% V2O5 across the three areas of mineralized tuff. The mineralization encountered to date shows lateral continuity over a combined area of approximately 0.4 square kilometres. Mineralization in the tuff at Pescado Norte lies in a northeast-trending zone that is aligned with, and may form the extension of, a mineralized channel in the adjacent gravel. The alignment raises the question as to whether there is a link between mineralization in the volcanic rocks and the adjacent gravel. 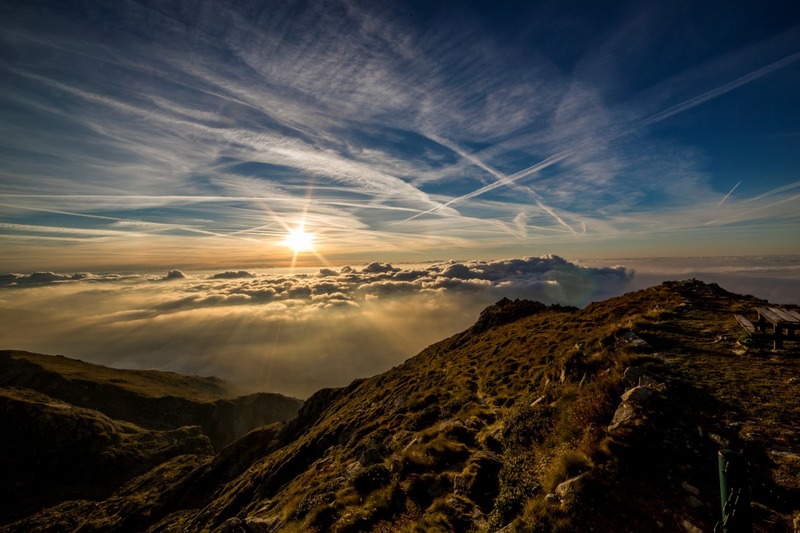 There is a possibility that the horizontal mineralized layer in the tuff derives from feeder structures deeper in the tuff – a possibility that will be investigated by drilling as available exploration funding permits. Beneficiation characteristics of the gravel at Laguna Salada are good, resulting in concentration of 82% of the gravel’s uranium into fine-grained material that constitutes just 9% of the gravel’s original weight, because the barren pebbles and coarse sand can be so easily removed by sieving. Beneficiation of the tuff, which does not contain pebbles, is likely to be less efficient at concentrating the mineralization; however, this assumption will be confirmed with test work in due course. Since the mineralization at Laguna Salada is contained within a flat sheet lying within three metres of surface, mining could commence at any chosen location. The Preliminary Economic Assessment “PEA”) modeled mining of the richest areas of the Laguna Salada Deposit followed by successively lower-grade areas so that the capital cost of the Project could be paid off as quickly as possible. Using the data available at the time of the PEA, this approach resulted in an estimated cash cost of production of US$11.62 per pound of uranium in year one, rising to average US$21.62 per pound over the life of the mine modeled in the PEA (Figure 2). Figure 2. 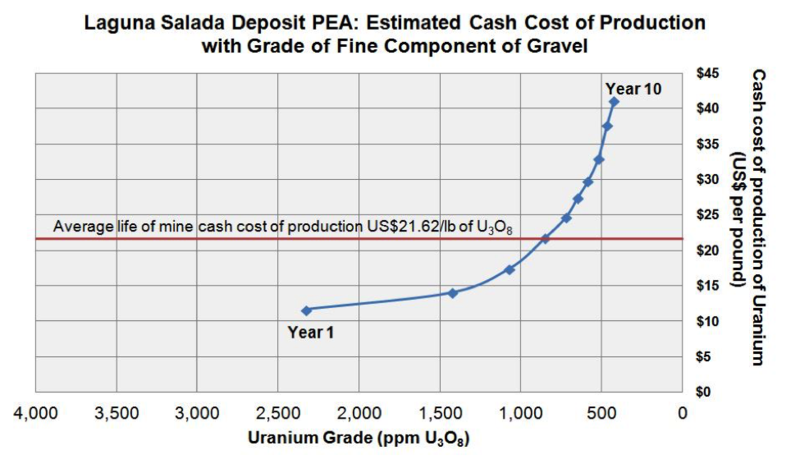 Estimated cash cost of production of uranium by year at Laguna Salada plotted against the average grade of the fine component of the gravel – the material that would be processed each year – as per data in the Laguna Salada PEA. The short-term work plan focuses on ways of reducing estimated production costs for the broader Laguna Salada Project through exploration for additional higher-grade material as well as through refining and improving the efficiency of processing techniques. Mineralization in the adjacent gravel, which will be more fully described in a press release shortly. In addition, a possible link between mineralization in the tuff and the overlying gravel at La Rosada has led to a better understanding of higher uranium-vanadium grades found at the base of the gravel where it lies on tuff in the Laguna Salada resource area – a concept that will be discussed with associated results in a future press release. Metallurgical test work to determine the efficiency of the U-pgrade © processing method to concentrate uranium and vanadium into a smaller mass than is currently being achieved with screening, constitutes a key step before pilot plant work can commence. Panel samples were taken on the walls of each trench, bagged and delivered to ACME’s preparation facility in Mendoza, Argentina. Each sample was crushed, split and pulverized to 75µm and a split of 250 grams sent for assay at ACME’s analytical facility in Vancouver, Canada, for analysis by ICP-ES and ICP-MS after four-acid digestion. QA-QC procedures were as described in the Laguna Salada PEA.